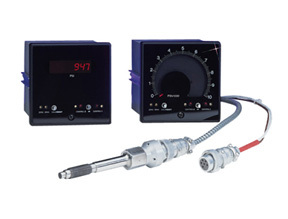 OMEGA’s melt pressure indicators also function as transducer power supplies and signal conditioners. The DP434 Digital Model has a large 3 1 /2 digit LED display which is easy to read, even from a distance, while the DP409 Analog Model has a 6", 240° arc (international scale) for easy viewing. Both units are housed in a standard 1 /4 DIN case. The DP434 and DP409 are designed for use with OMEGA’s melt pressure transducers or any 4-leg, 350 ½ Wheatstone bridge strain gage transducer. A calibration switch allows for a quick span check and adjustment for zero at zero pressure. The complete electronics assembly can be removed and replaced from the front without disturbing the wiring in back. Dual setpoint models can be used to give a preliminary warning before an actual shutdown sequence is initiated. HI/HI LO/LO, LO/Hl, or HI/LO alarm modes can be programmed, and the relays are isolated during a setpoint change or calibration check to prevent accidental emergency shutdown. Sensitivity Adjustment (Span): 1 to 2.5 mV/V or 2.5-5.0 mV/V switch selectable and fully adjustable. Display:For DP434: 3 1 /2 active digits, LED, 0.3 in height, plus extra digit fixed zero and selectable decimal point. For DP409: 6" scale, 240° arc.